Scuderia Toro Rosso have confirmed that they will not be using their new car, the STR3, in Turkey this weekend, thanks to Sebastien Bourdais' off in testing. There is some discussion, too, over whether to debut the cars at Monaco, the circuit being so prone to accident damage through brushing barriers or minor mistakes. One can see the wisdom in delaying the car's debut until the Canadian GP, particularly when considering the incident record of the team's drivers so far. I am not convinced that this should be a bad thing, however. The old STR2B is well-sorted and, although it is dropping towards the back of the field now that development has ceased, there is no guarantee that the new car would fare any better. It may be tempting to regard the Red Bull RB4 as identical to STR's version, but that ignores the fact that Red Bull have put a lot of development work into their chassis already. Some improvements may have been incorporated into the STR car but not all of them. Add to that the fact that STR are working with a different engine and we can see that the STR3 could perform quite differently from the RB4. Toro Rosso will be starting from scratch, in fact, and will have to develop their car on their own. This was demonstrated last year when the STR2 suddenly came good in the wet towards the end of the season after having been behind the Red Bulls in most of the races. Obviously, something about the development and/or the engine installation caused the STR2 to be a much better prospect when it rained. 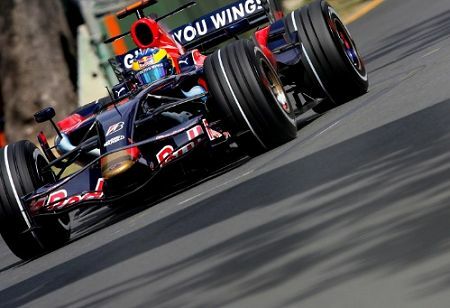 No such dramatic improvement was noticeable in the Red Bull cars. So the best plan for STR may well be to continue working on their old chassis until they can debut the new one with full spares for two cars. They are not going to win any races this year, anyway, so there is no mad hurry to get the STR3 out there - and there is always the chance that it might rain in Turkey and Monaco. The STR situation is just as interesting to relate to the problem of customer cars as is Super Aguri's death throes. Much of the argument against customer cars consists of fears that small teams will be able to enter F1 with a chassis bought from one of the top teams and immediately leap to the front of the grid. That sounds good but life just isn't like that. As STR have demonstrated, having an identical chassis to another team's does not guarantee identical performance. It is possible that a new team with, say, a McLaren chassis, could get pretty close to McLaren times at the beginning of the season - not likely, but possible. Yet inevitably performance differences will appear as the season progresses and McLaren work hard on development of their car. If the customer team is left to sink or swim in development of its chassis, it will most probably sink towards the back of the grid. This surely gives us at least part of the way to allow customer cars; let teams buy in chassis from other teams but outlaw assistance from the constructor thereafter. Effectively, this used to happen in the seventies - anyone with a bit of cash could buy a McLaren M23, fit a Cosworth engine into it and go racing. But McLaren gave no assistance and none of its customers raced higher than midfield. It was a sound design, the M23, one that McLaren developed for many years, and the reason the customer teams could not do much with it was their lack of experience and knowledge. There has been too much talk of manufacturer 'B' teams and the real threat they pose to the small constructor. This has largely been through the example of STR and SA, both teams receiving assistance from the parent company to some extent. If the FIA were to allow customer cars but ban 'B' teams, the fear of unfair competition would be lessened, at least. Prodrive could have been allowed to enter the sport with their McLaren chassis but left to develop it on their own. They might well have done a reasonable job on this, having the experience that they do, but I doubt their cars would have been on a par with the McLarens by this stage of the season. Dave Richards may be a good team manager but he is not good enough to put together overnight as efficient and capable a development team as McLaren have built up over the years. That is the kind of compromise solution that I suggested in my earlier post on Super Aguri. It seems obvious to me, yet I have never seen it suggested elsewhere. That indicates to me an unwillingness on the part of the parties involved to seek a way through the mess so that the sport might survive. And it is about survival, as Super Aguri are showing. It is time that the FIA stepped in and forced the teams to keep talking until a sensible agreement is reached. The alternative, including three-car teams as discussed on F1 Fanatic today, is too ghastly to contemplate. I think you have a grasp of the ideal way to treat the teams that use hand-me-down chassis, but I'm not sure the whole problem is solved in that way. I agree completely that the idea that if I have the funds to simply buy last years Ferrari, it does not guarantee that I will be able to find a set of mechanics and drivers that will put it on pole; it is preposterous that anyone would even consider that a valid argument. I think the problem I'm seeing is that neither Toro Rosso, nor Super Aguri showed much talent for developing last year's Red Bull or Honda to any competitive extent. I think wiser minds and deeper pockets prevailing, Super Aguri should be finding as much potential as possible in two-years-ago's Honda because last year's fared so badly. I think the other part I'm not visualizing, is, especially in the tactlessly named "Team Red Bull" (in Italian), that B-teams really aren't that much different from allowing four-car teams, if only those teams were allowed to run the current year's chassis. I -do- understand your thoughts on Prodrive, and actually didn't think they were going to be that threatening, unless they were planning to strap a Subaru engine to last year's McLaren. I don't think anybody reading this doubts that the problem is in the Concorde Agreement, which... Wasn't it supposed to have expired? I just can't beleive that things have been allowed to escalate to this level. The customer car/B team problem should have been sorted ages ago. If Max hadn't promised things that he wasn't in a position to promise, then this situation would have been resolved quickly. We keep hearing what a great job Max has done and yet the evidence is exactly the opposite. We have boring racing, shrinking grids and no Concorde Agreement in place. Max has proved uttery incompetent. His sole achievement is that he made Bernie richer than even he could have imagined. I hope the people who have a vote in the upcoming vote of confidence think beyond self interest when they cast it. I know that is a futile hope as so many of them are political animals who would sell their mothers for political advantage. I fear that you are right about the political nature of the FIA members, Steven. Have a look at Grand Prix dot com today for a glimpse at the manoeuvering going on behind the scenes. And Max is to blame for creating such a situation, too - he has made sure that FIA delegates become his trained lapdogs, indebted to him for one favour or another.